This set includes La Bella's amazing wound Low G string which adds lots of tonal warmth, depth and power to your tenor ukulele. The c,e,a strings are the same fluorocarbon strings found in set UT1. First off, I'm new at this uku thing. But I know what sounds good to my ear and feels good under my fingers. I was ready to declare Worth Browns as my favorite strings, but these Pepe Romeros beat them out. I like the way the feel under my fingers. Lower tension and a bit more substantial than Martin 620s. I'm not sure how they would be for a serious finger picker, but that's not me. I'm a Strummer. Anyway...I like them. They are my new favorite strings. 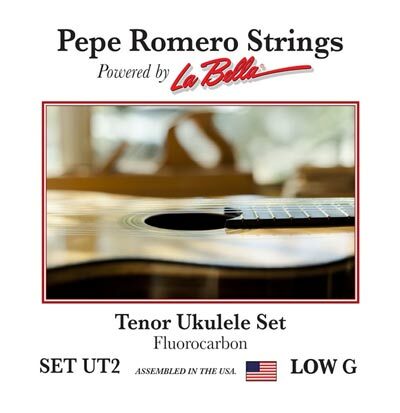 I use Pepe Romero Ukulele Strings on my Pepe Romero Ukuleles(2) because they make the ukuleles sound the best. These may be the best sounding strings I’ve ever heard. I am experiencing with different strings for my tenor Kala Elite. This will be the fifth set I’ve tried. The “A” string is strung very tightly while the others are not. The sustain is amazing and the low G does not over power. I am about to order another set and couldn’t be happier! Service and delivery time are all I could hope for. Thanks Strings by Mail. Love these Romero strings--sweet and responsive. Also love Strings by Mail--fast, easy, great! Ordered some ukulele strings before I needed just in case. They arrived quickly and were exactly what I ordered.. haven’t needed them yet. Q: What are the string diameter measurements?